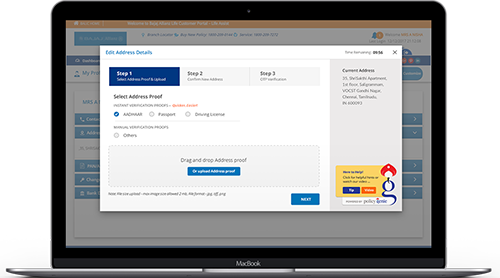 Update new address across multiple policies by sampling uploading your Address proof. Update and link your Aadhaar card across multiple policies. Update or change your mobile and email address. Update or link your new account details. Update personal details of multiple insurance policies from a single window. All details and updates are processed using safe and secure, compliant process. What is policy genie ? Policy Genie is a complete policy servicing portal which can be accessed using your eIA for updating any policy related changes. Can I use policy genie on all type of insurances ? Yes you can use policy genie on general, auto and health insurance provided the policies are converted into eIA policies using CAMSRep. Should I have an eIA to use Policy Genie ? Yes, to have easy access to Policy Genie, you will need to have a eIA account. This shall enable us to update the changes across all the policies. What is meant by instant update ? Instant update – Upon using certain type of supporting proof our application is capable of change request instantly like the address, email, contact & bank account number updates. This is called instant update. The turnaround for processing this request is instant. What is meant by manual update ? You can initiate the request at the front end and the execution shall be done by our back office team. The processing time shall be 24 hours. Why to need to have access to my registered mobile number ? At the end of every transaction the transaction gets validated through a OTP that is sent to the registered mobile number. What if my login fails ? You can make up to 3 attempts post which you may need to get in touch with our call center. What if I do not have a ID proof ? Proof of id is mandatory as per regulations. In case of non availability of proof please get in touch with our branch.